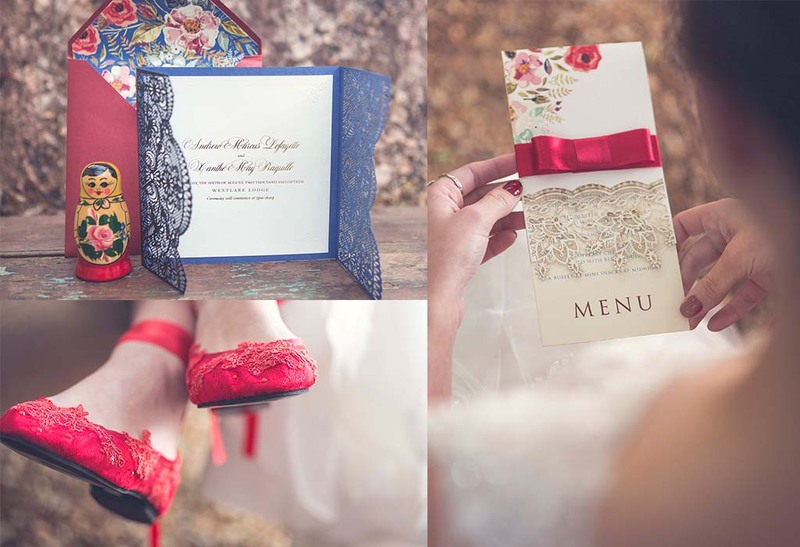 The amazingly talented Kusjka du Plessis Photography recently approached us to ask if we could create stationery items for one of her photoshoots. The moodboard of the shoot was based around the idea of Matryoshka dolls (Russian Nesting dolls), taking inspiration from the rich tones, floral details and uniqueness of the dolls themselves. Needless to say we leapt at the chance to design one-of-a-kind pieces for this theme. We love a creative challenge, and this one was so unique! We created a deep blue lasercut lace folder invitation with an embossed and gold foiled inner card. The envelope was in marsala red with a popping floral liner. The lace and floral detail was inspired by the elegant painting that you find on the traditional dolls, which we brought through to the menus. The results are absolutely stunning – you can check out the rest of the photoshoot on Burnett’s Boards here. You can find the Matryoshka stationery range ready to purchase on our online store here.